Home » Home » Ephemera » Also: Godzilla. As in “things Japanese people are pissed about.” Rock, Paper, Shotgun ran this and I just have to pass it along. Those are Japanese people holding signs written in Japanese complaining about Japanese roleplaying games and how they’re linear and stuff. Whole image follows. Now, call me crazy, but I’m not sure the fact that the world of Fallout: New Vegas is open and nonlinear is going to be that much of a selling point to a nation THAT WE DROPPED ATOM BOMBS ON. Of course, Medal of Honor: Rising Sun did fine in Japan, so maybe time has healed the wound. 11 Responses to Also: Godzilla. 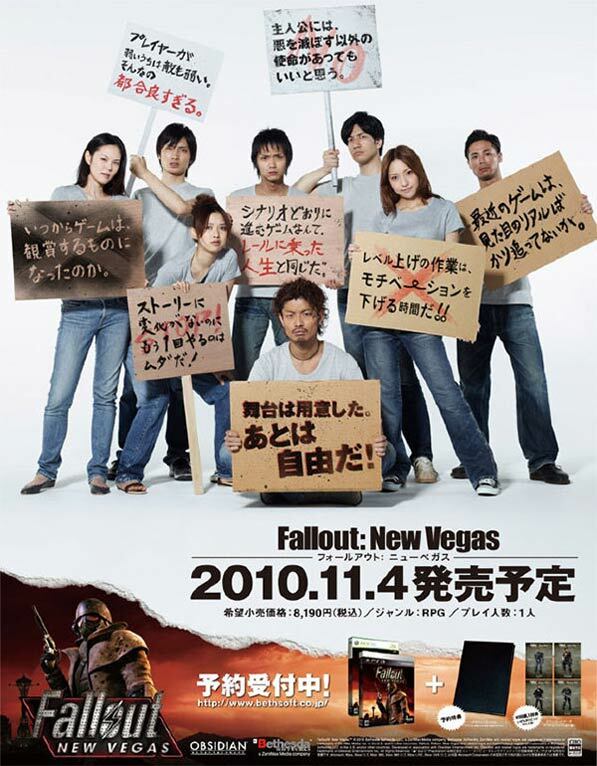 You got me wondering about how Fallout 3 sold in Japan, so I looked it up. It looks like in the first 20 weeks, it sold about 1.6 million copies on the consoles. Don’t know about PC. Unless they set a Fallout in Japan I doubt anyone would care. After all the whole point of the Fallouts is to vicariously share in the vision of a bombed out US. I have to disagree with you Scout. I understand the significance of the games being in the US considering the American 1950’s motif that exists throughout. But I do wonder about the rest of the planet whenever I play the games. I’d love to see what happened to China for instance, and run through the ruins of any one of its major cities. Or just about any other part of the world really. I think the gameplay, style, and mood of the game, along with the history and lore developed thus far can make for plenty of interesting games in other countries (Fallout: India would be awesome!) To me so much of the game is about exploration and discovery, and the world has plenty to offer there. As much as I would love playing a Fallout game in another part of the world, I’m sure people from other parts of the world enjoy playing the game in American cities. Los Angeles, Washington DC, and Las Vegas are all iconic places for people throughout the world, and playing a game in the bombed out remains of any of them can be and has been fun for an international gaming community. I know Fallout isn’t exactly serious political commentary about nuclear war, but it doesn’t overly make light of the subject either. Perhaps the people of Japan can appreciate the game on a deeper lever, all things considered. @Armand: Hmm, interesting. And there’s me thinking that the Japanese were happy in their role playing rut. Judging by those figures, it would seem there’s a divide emerging. You might be interested in this article as well Armand. One of the things I appreciate about Fallout – all the Fallouts – is that the franchise manages to be essentially a dark comedy without ever trivializing the concept of nuclear war. It’s something that could have been so easily mishandled, but so far has been done quite masterfully. It’s less that I thought the Japanese would dislike Fallout on a cultural level due to the bombings, and more that I found it odd Bethesda chose to use this particular franchise as a vehicle to complain about the JRPG style. Thanks Gregg for the link, and thanks Lewis and Mat for writing it! Interesting tidbit about Fallout 3 in Japan. Do you guys remember that they censored the Japanese version? Took out Mr. Burke, and the ability to activate the bomb in Megaton. Also changed the Fat Man’s name (for obvious reasons). Matt, I couldn’t agree more with you about them not trivializing the concept of nuclear war. They set the tone so well early on with the Ron Perlman narration, which sends shivers down my spine every time! I forget if it was the intro to the first or second game, but when they have the soldiers execute the prisoner and then wave at the camera over the sound of happy 50’s music, it captures something of the darkness of war and the potential insensitivity of man so well. As for the difference between western rpgs and Jrpgs, I remember playing the original Xenogears on the first playstation system. It was ridiculously long, but man did it capture my imagination. Thus I was so excited about the new one on the PS2. I picked up a copy, started playing it, and then about an hour and half later, I realized all I’d been doing was watching cut scene after cut scene with almost no game play, and I had absolutely no idea what was going on. Never made it very far in that game.. I wonder what native Japanese gamers think about the divide and the difference between the two cultures of gaming. I have next to no interactions with gamers form Japan, and really don’t know how they feel about the debate we’ve been having in the West. It doesn’t come as a surprise that Fallout would do well in Japan though. I think such a solid game is always going to sell well, despite some of the cultural barriers. And it seems the Japanese are as fascinated by western culture as we are with theirs. Lastly, as will be apparent the more I talk about it, I freakin’ love Fallout 3. The original games were on my Top 10 since the 90’s, but Fallout 3 has become my all time favorite game. You will see me go from logical adult to raving fan boy in any discussion about the game given half the chance. I still play it all the time! It’s actually made it difficult to play other games because they AREN’T Fallout.. Sad, I know.. Right after posting my last comment (well, many comments in one post..) I read this over at Kotaku and thought I’d share as it has everything to do with what we’ve been discussing, but from a somewhat different viewpoint. Though I agree with much of what the author has to say, I think his critical view of Bethesda and Bioware are a bit over the top. That said, Wizardry has a very special place in my gaming history, and I’ve been itching to play something like it for a long time. The Etrian Odyssey games on the DS capture a bit of the flavor, but have a long way to go. In case you guys are unfamiliar with Etrian Odyssey, you can see it as an attempt at the old school western rpg by the Japanese. And on the DS! A gaming platform I feel is very well suited for such games! Armand, my point (poorly made) was that if Bethesda made a Fallout set in a nuclear devastated Japanese city, say Kyoto, there would be some media blow back for the obvious reason that the US dropped atom bombs on their country. I would imagine Japanese Fallout fans, on the other hand, would play it regardless. Sorry Scout, but yeah, I missed your point the first time around. And it is a good one. Having a Fallout game IN Japan made by Americans could spell media trouble.. I can see the main stream media salivating over the possibilities. I wonder how a more serious game (perhaps made by a Japanese team) that approached post nuclear drop Japan would work. It couldn’t be a Fallout game in my opinion, but maybe something of a serious adventure game or something..
I’d love to see more games where instead of shooting mutants (zombies, super-villains, terrorists, whatever) you deal more with the real life elements of tragedy and disaster. Being able to walk through Hiroshima or Nagasaki and seeing in game the effects those bombs had on the populous could be an amazing experience. I imagine it would be a pretty heavy atmosphere and story, and would have to be approached in a very considerate and mature manner..
Leigh Alexander had an article at Kotaku titled Who Cheers for War that I really appreciated that sort of touches upon this. She was writing about seeing the preview for Killzone 3 at E3 and how everyone was so impressed by the graphics and explosions and such, but sort of ignored the fact that these games (for better or worse) glorify war. 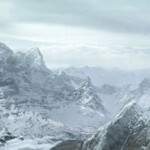 The closest I ever came to such an experience in gaming was in the early parts of Half Life 2. When you have no weapons, aren’t sure what’s exactly going on, see scary armed men who don’t much like you everywhere.. yeah.. the game became more of a regular (albeit awesome) shooter when you got your suit and some guns, but those early parts always stick out in my mind for coming closer to capturing the feel of being powerless in a very bad place where bad things happen to helpless civilians.. Sorry, I got off track a bit, but this is the stuff that’s been on my mind lately. No need to apologize, Armand. I didn’t really make myself clear. Sorry. Fallout Vegas looks great, but feels “off” to me. It doesn’t feel like a Fallout. It’s all far too civilised, populated and constructed. There’s no desolation or misery, despite the plot excuse they shoe horned in, it’s just “off” the money for me!